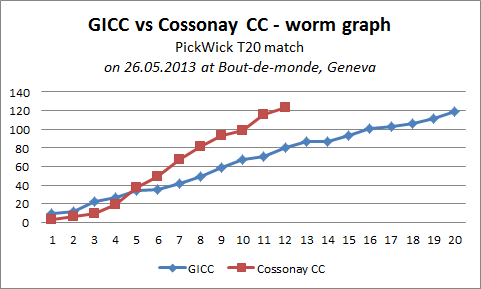 Cossonay Tigers travelled to Bout-De-Monde Geneva, to take on GICC in their second Swiss Pickwick T20 match. Having lost their opening game, it was a do or die contest to keep the hopes alive in the competition. 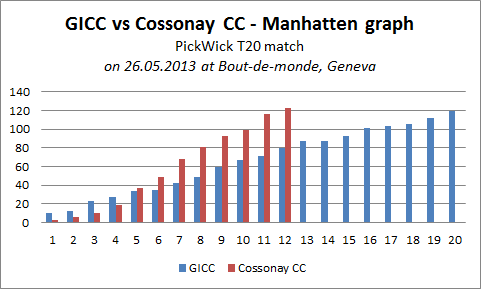 Cossonay had a well balanced team, boosted by the return of standing skipper Gnana (coming off injury) and Sathya. Winning the toss and batting first, GICC’s openers fared well against Cossonay’s bowling attack spearheaded by Kishore and Himank, scoring 10 of the very first over. Kishore was a bit erratic initially, but came back strongly to dismiss Ranjit(20) and Gaurav(2). He was unlucky not to have a third, when a usual suspect (the reporter won’t take name) dropped a sitter. Himank, as is habitual, troubled the batsmen with his in swingers, picking up the wicket of Senthil. By drinks break, GICC had accumulated 49 runs for 3 wickets in 8 overs, a subdued score given the easy nature of wicket and short boundaries. Jasbir and Arjun continued the good work in the bowling department and did not let the batsmen open their arms. Both shared a wicket each. From GICC, Ankit (25) was the only one who looked threatening with the bat. With Vaibhav’s ( a self styled death bowling specialist ;)) and Anil’s economical spells at the end, GICC were all out for 119 runs in 20 overs. Once again all the bowlers used picked up wickets which is an indication of the quality of the squad. To avoid the possibility of rain playing spoilsport, Cossonay decided to score at a brisk pace and finish the game. In the first 3 overs, openers Sathya and Sriniketh were patient and got a good feel of the pitch. Soon they unleashed their wrath on the bowlers. Sathya went berserk hitting some mighty straight drives and pull shots for six. Sriniketh on the other end was deft and solid, hitting boundaries effortlessly. In no time, the scoreboard motored along to 81 runs in 8 overs, with Sathya scoring a brilliant fifty in the process. Sathya was caught out for 56 just before the drinks break. Sriniketh (46) and Arjun (10) made sure there were no risks taken and chased down the target in 12 overs. Sriniketh got out right at the end for Lalit to complete the formality. At the end it turned out to be a comfortable victory for Tigers. But more importantly the Pickwick campaign is back on track, and winning with a healthy runrate would always prove crucial at the end. Lets continue playing with the same spirit in all the upcoming matches !